Despite its hot start to game two, Dartmouth could not maintain its fiery play to force a deciding game three on Sunday afternoon. The Harvard men’s hockey team dueled familiar Ivy League foe Dartmouth this weekend for a spot in the ECAC’s annual mid-March pilgrimage to Lake Placid, N.Y. In a best-of-three quarterfinal series, the No. 14 Crimson did not even require the third game, ending the Big Green’s season with a pair of victories at the Bright-Landry Hockey Center. 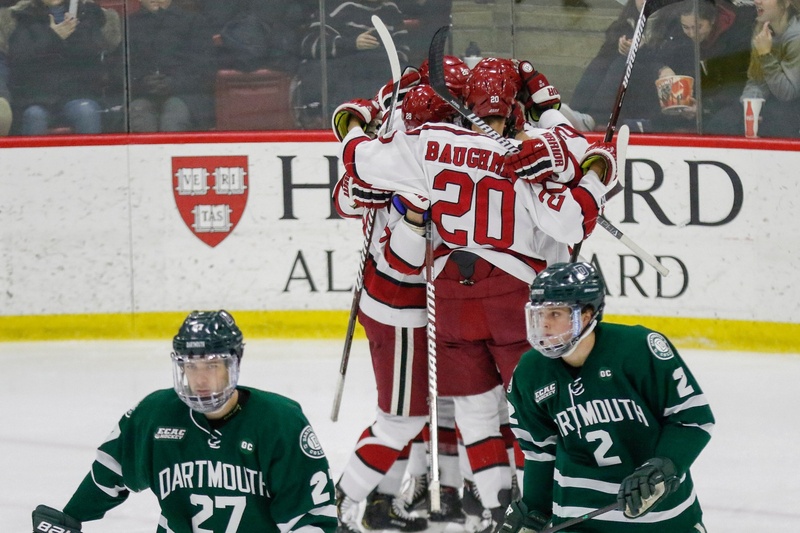 Harvard (19-9-3, 13-7-2 ECAC) followed its 3-1 triumph on Friday with an emotional 4-3 overtime clincher the following evening, knocking off Dartmouth (13-17-4, 10-9-3) in the 13th clash in the past four seasons with its Hanover, N.H., counterpart — the most common opponent for the Crimson during that span. With the series win, Harvard extends its home win streak to eight games and remains unbeaten (9-0-1) at the Bright in its last ten bouts. A pair of victories this weekend has furthered the team’s case for an at-large NCAA Tournament bid, even if its result in Lake Placid is unfruitful. A back-and-forth affair did not produce a victor in regulation, so the teams headed to overtime notched at 3-3. 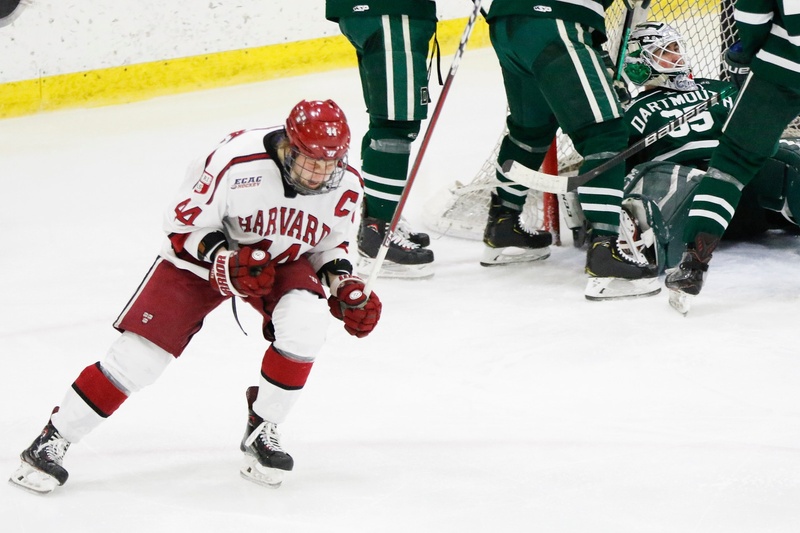 The Big Green was determined to extend its ECAC playoff run, while Harvard recognized the danger of allowing a formidable team to take the series to an unpredictable game three. Ultimately, the superior team prevailed. Two minutes into the extra frame, sophomore forward Jack Badini regained the puck at the boards below the left circle and shuffled a pass to linemate Nathan Krusko. The junior punched home a wrap-around goal, ending Dartmouth’s season and causing his teammates to spill over the boards to celebrate. Harvard eliminated Dartmouth from the conference playoffs in straight games, not needed the third game in the best-of-three series to seal the deal. Thanks to the Crimson’s win to open the series, the Big Green’s season was on the line Saturday night, and the team’s performance out of the gate reflected as much. Before the contest was three minutes old, Dartmouth had already potted two pucks. Just one minute into the game, an offensive-zone faceoff win from junior forward Ryan Blankemeier resulted in a screened point shot finding its way past the Harvard goal line. Sophomore defenseman Brendan Demler was the culprit on the golf-style shot. A shift later, sophomore forward Quin Foreman’s shanked one-timer ended up being a perfect cross-crease feed for freshman linemate Drew O’Connor, who buried his chance. With his strike on Saturday, O’Connor added to his ECAC lead in tallies by a rookie with 17. He finishes his debut campaign ranked second in Division I among first-year goal-scorers. 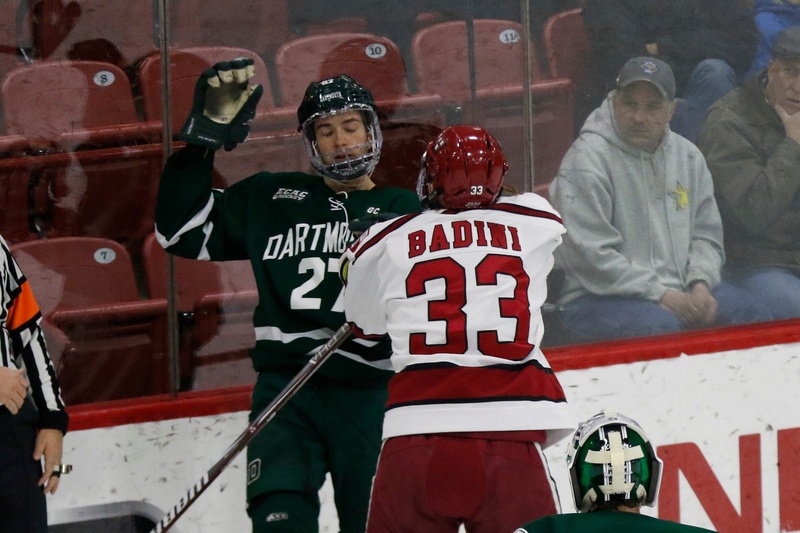 After last year's ECAC quarterfinal clash, tensions were high in all four meetings between the Crimson and the Big Green this season. In a two-score hole, Harvard had to answer quickly — and it did. Junior defenseman Adam Fox wasted no time on the Crimson’s first powerplay opportunity of the night, sending a wrist shot through traffic just 10 seconds into the man advantage. Freshman forward Jack Drury got his stick on the puck and redirected it past Big Green net-minder Adrian Clark to cut the early deficit in half at the 12-minute mark of the opening period. Fox’s first of three helpers on Saturday knotted him with Princeton’s Ryan Kuffner (22–22—44) for most points in the ECAC this season. The Tigers bowed out to Brown last weekend, signifying the completion of their season and Kuffner’s career at Princeton, so the conference scoring title is Fox’s to lose. Second-period goals from sophomore defenseman Reilly Walsh and co-captain Michael Floodstrand propelled Harvard to a 3-2 lead before Foreman tied the game. An active but scoreless third stanza forced the teams to overtime, setting the stage for Krusko’s game- and series-winner. 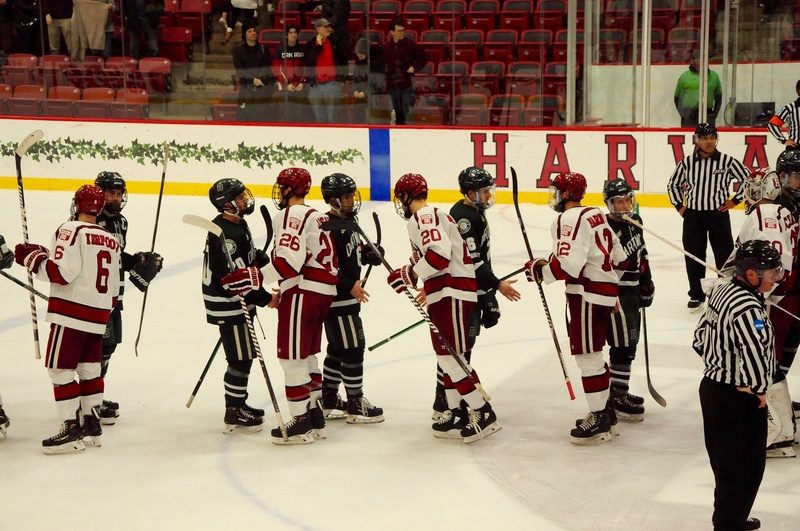 Friday’s tilt saw the continuation of multiple regular-season storylines for the Crimson. 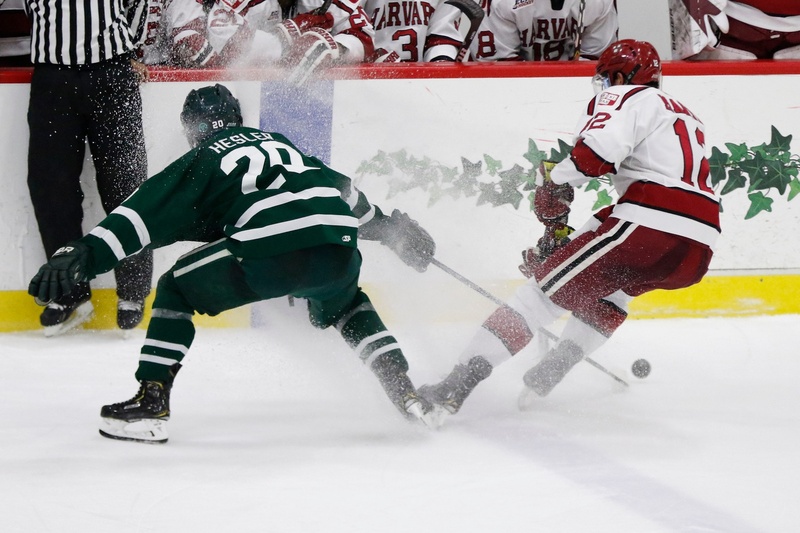 For starters, a competitive Dartmouth group tripped to Boston with revenge on its mind: last year, in the same round of the ECAC playoffs, the Big Green stole game one before Harvard roared back to claim the series. Both regular-season meetings between the teams were charged with this animosity, and this weekend was no different. Co-captains Michael Floodstrand (pictured here) and Lewis Zerter-Gossage set examples on and off the ice this weekend in the Crimson's 2-0 series sweep of the Big Green. Following a trend that defined much of the campaign, the Crimson rode its high-end talent to victory on Friday. Fox, arguably the most talented offensive blue-liner in college hockey, registered a point on all three Harvard goals (1–2—3). His productive evening marked the first of two three-point efforts this weekend and included the game’s eventual winner. Just past halfway through the third period, Fox swerved past O’Connor in the neutral zone, entering the offensive third with a two-on-one opportunity. A give-and-go play between Fox and junior forward Colton Kerfoot set up an easy tap-in on a mostly empty net for the defenseman. Fox moves on from his dominant weekend with a new career high in points (9–37—46), which he set on Friday night. 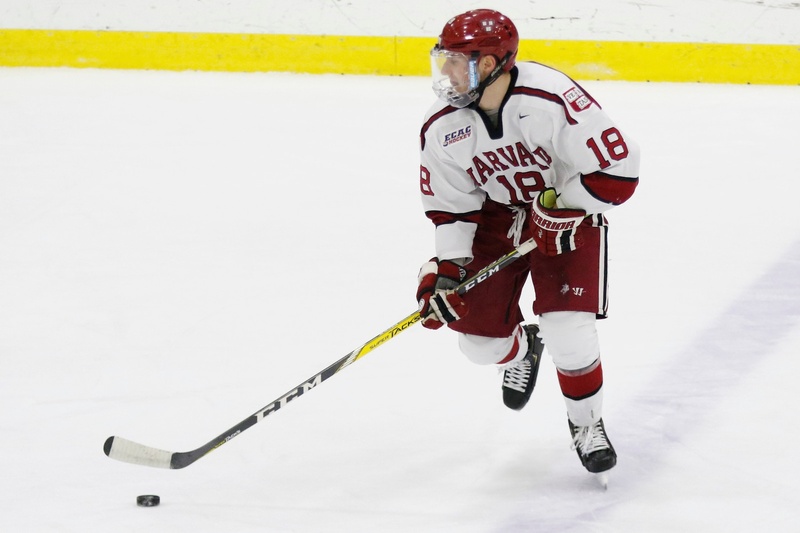 He is now tied with Mark Fusco ’83 for the most points scored by a Harvard defenseman in a single season (13–33—46). Defenseman Adam Fox is on the short list of college hockey's most elite players. This weekend, his pair of three-point outings showed why. Another crucial component of Harvard’s success this season has been the timely and plentiful scoring contributions from co-captain Lewis Zerter-Gossage. The senior paces his team in goals with 18 and sits seventh in the nation in goals per game (0.58). But perhaps more important than the sheer volume of Zerter-Gossage’s tallies is their oft-clutch nature. The Montréal, Qué, native has found twine when his team has needed it most, providing a shot in the arm to his offense at key turning points of games. November’s win over then-No. 15 Cornell at Madison Square Garden, as well as a more recent February triumph over Brown, are two such instances of Zerter-Gossage’s proclivity for big-time goals. Friday’s outing proved that this regular-season storyline, just like Fox’s dominance, is here to stay in the postseason. It was Zerter-Gossage who evened the game mid-way through the second frame, sending a puck goalward that ricocheted off the skate of Big Green point man Joey Matthews on its way to the back of the net. Offensively, Harvard carried play from Zerter-Gossage’s goal forward. Kerfoot sealed the victory, as well as a multi-point game for himself, with his empty-net goal from mid-ice in the waning minutes of Friday’s contest. Between the pipes for Harvard this weekend was junior Cameron Gornet (5-3-0, 2.43 GAA, .920 SV%), who has done an exceptional job filling in for an injured Michael Lackey after the senior went down with a knee injury in mid-February. Friday night, Gornet (1 GA, .950 SV%) sent away all but one of the 20 shots he faced, ceding Dartmouth’s lone goal to Blankemeier to open the scoring in the middle stanza. On Saturday, the Crimson backstop (3 GA, .923 SV%) made crucial saves to limit the damage the sizzling Big Green inflicted early on. Lackey continues to make strides in his recovery, first discarding his crutches and brace last week and then participating in goalie training — but not formal practice — in the days leading up to the quarterfinal weekend. Given Gornet’s solid play since Lackey went down (5-2-0, 1.87 GAA, .935 SV%), coach Donato will have a tough decision to make in the crease if and when Lackey is healthy enough to play again. The Crimson now awaits the conclusion of the conference quarterfinals as it looks ahead to its final-four competition in Lake Placid. The group will battle Clarkson if Cornell completes a series comeback against Union, but if the Dutchmen send the Big Red packing, they will become Harvard’s semifinal foe.